To be honest, I haven't been listening to very much music lately. I've been rotating the same 5 albums over and over again in my car, and have been disappointed by most of everything being released this year. Hence, the lack of posts lately. Since I can't find anything new worth posting, I'll start uploading some of the random albums I have on my hard drive. I saw this guy open for Animal Collective a few years back, and was thoroughly entertained by him, although it seems like this guy should not be entertaining at all. He stood in one spot, held his microphone, turned on his ipod, and talked in rhythm along with the simple beats created on his own, but it's because of the lyrics that BARR is able to pull this off. His music IS his brain. He makes you feel as if you are listening in on his personal thoughts. It ranges from unfiltered gibberish and intentional stuttering to some fine usage of alliteration. Either way, he manages to tell some humorous stories. Not every track is solid on this album, and his newest release was disappointing, but track 3 alone makes this album worth listening to. 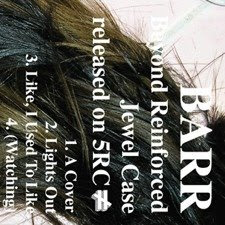 can you please fix this link "BARR - Beyond Reinforced Jewel Case"